The results are good news: the percentage of shops using ‘girls’ and ‘boys’ signs has reduced by 60% compared with when the campaign began last Christmas, dropping from half of all shops a year ago to just a fifth today. “While there’s still a long way to go to address sexism in the toy industry, the changes in major retail chains like Debenhams are just brilliant to see. They’ve replaced pink and blue ‘Girls’ and ‘Boys’ signs with new colourful signs that say ‘Vehicles’, ‘Superheroes’, ‘Soft Toys’, and ‘TV Characters’, among others. Everything is much easier to find and children are no longer being sent the message that science and adventure are only for boys, crafts and nurturing play only for girls. Hobbycraft tops the list of stores marketing toys without relying on gender stereotypes, with second and third place going to Toymaster and Fenwick. The results showed Fenwick, Debenhams and TK Maxx to be the most improved, all having recently decided to stop using ‘girls’ and ‘boys’ signs and display toys by category. The worst culprit for using gender to sell products was supermarket chain Morrisons. Despite promising in July to take down ‘Boys Toys’ and ‘Girls Toys’ signs many were still to be seen in November. 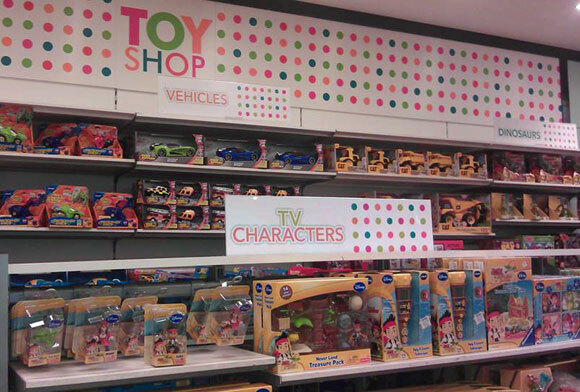 Where they have been replaced, toys are still grouped by gender, with prominent pink and blue ‘Toys’ signs. In general supermarkets were shown to favour stereotyping the most, while independent stores were the least likely to use gender stereotypes in toy marketing. Of the fourteen major retailers we contacted this year and asked to remove ‘girls’ and ‘boys’ signage from shop floors or own-brand toy packaging, seven have already done so (Hobbycraft, Boots, TK Maxx, The Entertainer, Debenhams, Fenwick, Next) and five are in the process of doing so (Toys R Us, Marks and Spencer, Tesco, Sainsbury, Morrisons). See our Who’s doing what? page for more details. The survey results are not all good news. Just over 70% of stores still used some kind of gender cues, (such as grouping stereotypically girls’ toys together, rather than organising by type, eg princess dressing up near the dolls rather than with other role play or dressing up), with 40% of stores using gender to sell the majority of their toys. I wonder how much is driven by the toy companies too? You say in the article that princess dressing up is near the dolls, for example. Is this character/franchise driven (not that I am excusing this!!) or is it actually a value judgement on girls vs boys toys? Toy and film companies aim to maximise “standout” on the shelf by encouraging retailers to merchandise everything together, which could also lead to these issues. Just a thought – maybe we need to start talking to Hasbro and Disney et al. Unfortunately we do accept such outdated thinking for adults, just look at the magazine section in Morrisons and you will see how science, history and intellectual magazines are men’s interests and the home, cooking and crafts are women’s interests, apparently it isn’t in men’s interests to cook and certainly not in women’s interests to be intellectual! Please everyone who reads this phone morrisons to complain, there have been numerous petitions on this as well as complaints but Morrissons seems hell bent on gender steriotyping, they wouldn’t tell me who was in charge of their store layout, they take down the signs for a day or even a month at most then replace them,why are they so concerned with telling people how to think?